In this short video, Pushpa Mary describes the challenges facing women and her experience growing her own vegetables. In 2016 the kitchen garden beneficiaries increased from 375 to 410 families, from a total of 20 villages. ANISHA staff visited the villages about once per month. 352 families are now saving their own seeds; the remaining 58 families are given seeds from the ANISHA seed bank. In the month of March snake gourd and tomato seeds were sown, again in July around 8 varieties of vegetable seeds. The same drought situation occurred here, so only a few families successfully grew vegetables like radish, okra, brinjal, bitter gourd, field bean, sponge gourd, pumpkin and bottle gourd. In comparison to last year, where an average yield was 80-180 kgs. Each family consumed 8-10 kg. of vegetables during the year. Overall, during the year 3786 kgs. of vegetables were grown by 410 families and saved Rs.1,13,660/- for one year. In 2017,the situation was better and the gardens yielded sufficient produce. Many residents of the Martalli region have tiny plots of land round their houses, even if they are considered "landless". In these cases, there is no way to earn a living from agriculture, the primary source of livelihood in Martalli. Therefore, almost all of the men in these families work in rock quarries in another state, living away from home for months at a time. It is the women, then, who attend to the homes and tend to the bit of land that they own. For these women, Anisha distributes vegetable seeds and provides training in how to start home gardens. Through these gardens, women can grow enough vegetables to feed their families which has a positive effect on the household budget, or, as in many cases where families are very poor, gives them healthy nutrition for the first time in years. 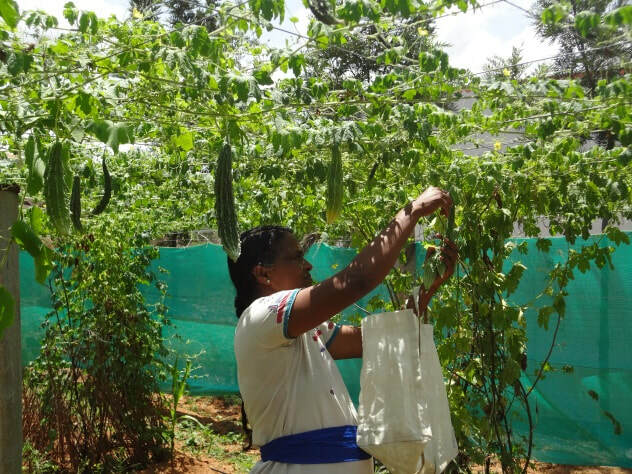 Anisha has also introduced new varieties of vegetable seeds, expanding the range of healthy vegetables considerably as they include those that can be stored and processed for the months where the garden is not productive. And in the drought prone district of Chamarajanagar kitchengardens because of their small size can be sustained even when the crops in the fields are failing. 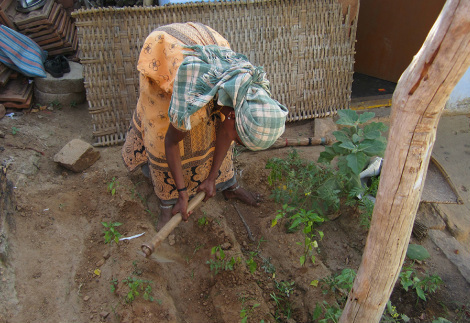 Anisha helps women start home vegetable gardens even if they only have a small amount of land. 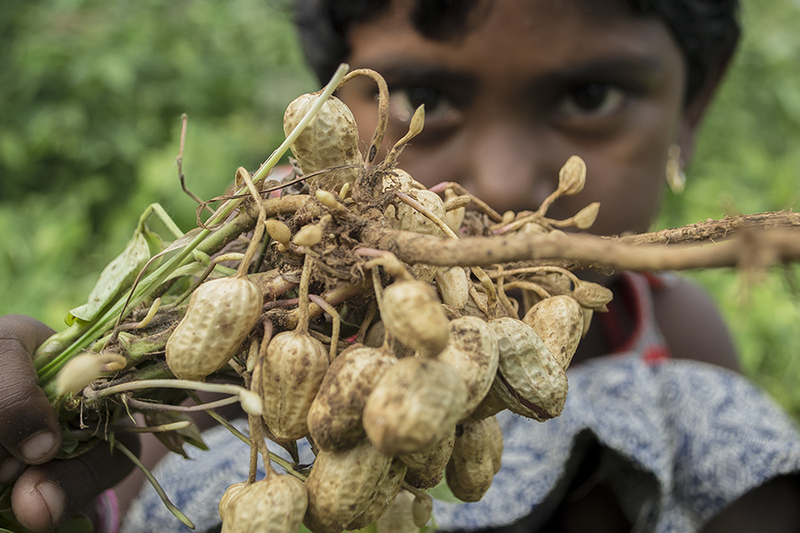 A little farmer in training shows off peanuts from her mother's garden.